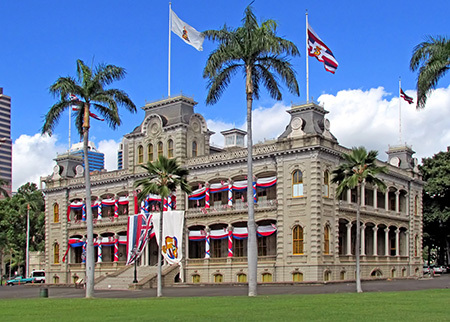 Iolani Palace is a powerful symbol of Hawaii's past and its future. It is the mission of The Friends of Iolani Palace to preserve, restore, and protect this wahi pana (celebrated place) for local residents and people from around the world. By sharing, we perpetuate the history of the Hawaiian kingdom through this living restoration known as Iolani Palace. In these challenging economic times, your support is more important than ever. We'd like to ask that you please consider a generous gift to the Palace. Your contribution will ensure continuation of the education, conservation, and preservation projects to which we are deeply committed. We extend our most heartfelt thanks to you for your kakoo (support) and aloha. Aid in the search for and acquisition of original objects to refurnish the Palace. Please contact the Palace Director of Development for additional information. for additional information. Philanthropic support of caring individuals through bequests, trusts, and other planned giving has been important for the support of Iolani Palace. Unrestricted gifts provide critical support for daily operation and maintenance of the royal residence that is so vital to our work in historic preservation, education, and conservation. Donors with a particular interest in the Palace are encouraged to make a targeted gift. Donations can be specified toward a range of options, including the Palace's acquisitions fund, educational projects, new Gallery exhibits, and more. Honor that special person with a tribute or memorial gift in recognition of their special love of Hawaiian history or culture. Your contribution will be acknowledged on Iolani Palace donor lists and to the honoree or their family. Check with your Human Resources department to find out if your employer has a matching gift policy. If they do, they will usually provide you with a Matching Gift Form or other form to submit with your donation to Iolani Palace. Giving appreciated assets may enable you to avoid paying capital gains taxes while simultaneously getting a tax deduction and helping Iolani Palace.